Over the past year and a half my Internet activity has followed the same general cycle as the stock market. Both rose progressively to greater and greater heights, finally reaching an unsustainable peak - and then rapidly dropped down to a fraction of their former levels. The collapse of my personal investment of time in the Internet only took a few weeks, whereas the stock market has been plunging steadily since January 2008. The loss of stock value did accelerate in the month of October, but it now seems to have levelled off. Despite minor differences, these two boom-and-bust cycles share a common principle: there comes a point at which accumulated value must be destroyed in order to allow new growth. My cycle of intense internet activity began in early 2007, when I firmly decided to create my own website. By late Spring I had installed about 3 or 4 sites, only to discover that no one looked at any of them. So I began studying Search Engine Optimization, in an unsuccessful attempt to draw visitors. In the Autumn of 2007 I realized that I could reach a far larger audience by editing articles on Wikipedia. But I soon got bogged down in Wikipedia edit wars. Then in late November of 2007 I discovered Second Life, and Danton Sideways was born. In December I joined the Confederation of Democratic Simulators (CDS), which was my first true Internet community. 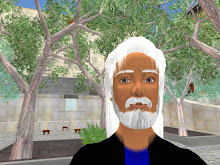 I started the present blog, where I recorded my progressive discovery of the virtual world of Second Life. I began attending meetings of the Citizen's Social Democratic Faction, which is one of the CDS political parties, and I also sat in on the weekly meetings of the CDS Representative Assembly. Plurk, which is still more time-consuming than Twitter. Meanwhile I began to get involved in OpenSim, and even started my own OpenSim blog. By the beginning of Summer 2008 my situation had become unmanageable. I was spending every free minute I had in front of the computer, and it was still not enough. In late July I took my family on vacation in Italy, where I stayed online thanks to my Asus 3e netbook. But once back home I realized that I was completely overextended, and needed to cut back. So I started pulling out of my various Internet activities, gradually at first, and then with increasing speed. At the top of my cycle I had at one point stumbled on a video about screen addiction, starring a cartoon character who comes up for air in "real life." That is what it felt like. It was as if I came back among the living. I posted my last article on this blog (before the present post) on August 11th. I made my last Plurk on August 24th. On September 8th I sent an email to my friends in CSDF, announcing that I was reducing my time in Second Life. I made my last tweet on Twitter on September 18th. From there on, my activity on the Internet (other than a bit of normal googling and emailing) dropped to virtually zero. As chance would have it, my personal Internet bust coincided closely with the great stock market crash of October 2008. The stock market drop of 2008 is in reality no greater than that of 2002-2003, as can be seen by a glance at a historical chart of the Dow Jones average. But October 2008 saw something much worse: a worldwide financial crisis, following the huge U.S. housing price crash. Alan Greenspan calls it a "once in a century credit tsunami." After having studied this crash on the Internet for a few weeks, I'm convinced that it is the equivalent of that of 1929, and that we are entering a period of extended deflation which will be the equivalent of the Great Depression. I expressed this opinion, for example, in a comment on one of the blogs devoted to the Kondratieff Cycle. That we may be on the verge of a new Great Depression is just a hypothesis. What remains true is that periods of reduced activity serve a very important function: they permit new healthy growth to begin. Thus the economist Schumpeter talked of creative destruction, in the sense that accumulated value must be cleared away in order that new value may be produced. In my own case, much of my Internet activity had carried me far from my original aims, and had become an end in itself. By severely cutting back, I gained space to reflect upon what I really want to do, which is (as always) to promote the development of convivial tools. So I am coming back online, timidly and cautiously, to work on my personal projects. At the rate of maybe a few hours per week - instead of 24 hours per day.